At long last my shelving for my paintings is nearly ready! My hands are sore from cutting and putting things together, but my heart is happy! 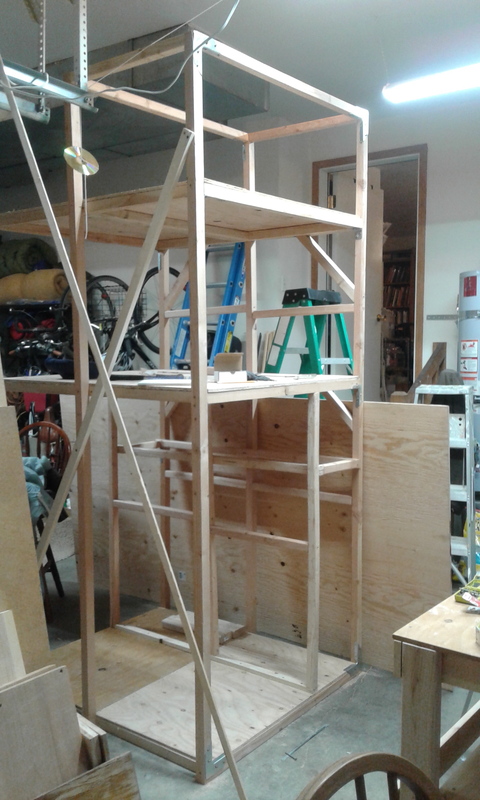 I plan to make a simple structure for really large paintings too that will sit right next to it between the painting shelving and the shelving for my ceramic sculpture and wall plaques. With my husband’s help, I am in the process of finally getting my studio in the garage habitable and functional in time for Open Studios this following weekend (Nov. 11 and 12th). There just was too much going on this last summer for us to focus on making the garage habitable. In fact a friend was using a good part of the space to repair his truck! I just couldn’t work in it during all that. Instead I painted in the basement–which quickly became a huge mess since I didn’t want to set up shelving down there. As soon as I finish with this shelving project and arrange the space, I’ll be moving my paintings etc. up into my part of it, just in time for Open Studios. As you might imagine, although I am very busy, I am in a very celebratory mood! !